It was in the early morning on Monday, April 8, 2019 when God called his daughter home surrounded by her loving family. Evelyn McMahan Trantham Dalton peacefully left this world and entered Heaven’s gate. She was born on March 30, 1930 in Yancey County to the late Wilk and Annie Mae Stiles McMahan. She had just turned eighty nine years old and received her wish of being home with her family for her birthday party. She is survived by her two devoted children, her baby boy, Gary Lee Trantham (Cora) and her daughter Charlotte Trantham Roddy (Greg). 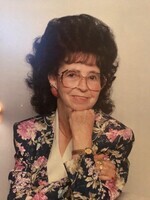 She has twelve grandchildren, Jeff Trantham (Candice), Timothy Bo Trantham (Tammy), Chris Trantham, Johnny Trantham (Sabrina), Darrin Adams (Crystal), Jody Trantham (Beth), Brooke Cooper (Chuck), Gary Trantham II (Chelsea), Timothy Whitesides (Kristy), Michelle Hughes (Ben), Haley Barker (Andrew), Michala Allred (Brandon); twenty nine great grandchildren. She has three sisters, Ruth Epley, Sallie Phillips, Lettie Hoglen and one brother Charlie McMahan. Evelyn was preceded in death by her oldest boy Jerry Trantham, her sister Bessie White, and three brothers, Floyd McMahan, Carl McMahan and Wayne McMahan. Evelyn spent her working years in textiles. She was known for her nurturing heart and love for her family. She demonstrated this love by cooking and caring for her children and grandchildren. Her passion for gardening and flowers gave her great joy. She loved music and dancing and most importantly she loved her Lord and Savior Jesus Christ. She was a devoted mother and made her children very proud to call her Momma. Services for Evelyn will be held 3PM Wednesday April 10, 2019 at Crowe’s Mortuary with the family receiving friends one hour prior to the service. We would like to thank all of our family and friends for the enormous amount of love, support and prayers we have received during this difficult time. Online condolences can be made at www.crowemortuary.com.